The mission of Urban Philanthropies is to transform distressed urban communities through economic and community development activities for the enhanced quality of life of the residents. We do this through our Business Boot Camp Initiative, Urban Warriors Cyber Security Job Training and Rent Subsidies. Urban Philanthropies is committed to preserving, empowering, and transforming distressed urban communities. Overview of Urban Philanthropies and the Business Boot Camp Initiative. Recap of the Business Boot Camp Initiative Pitch Night. Overtown Business Boot Camp participants in class at CIC Miami. Participants receiving their micro loans to jump start their businesses. Philip Bacon and the Global 1000 partners after a successful hiring event. Overtown Business Boot Camp participants that successfully completed their entrepreneurial training and are ready to start their businesses. 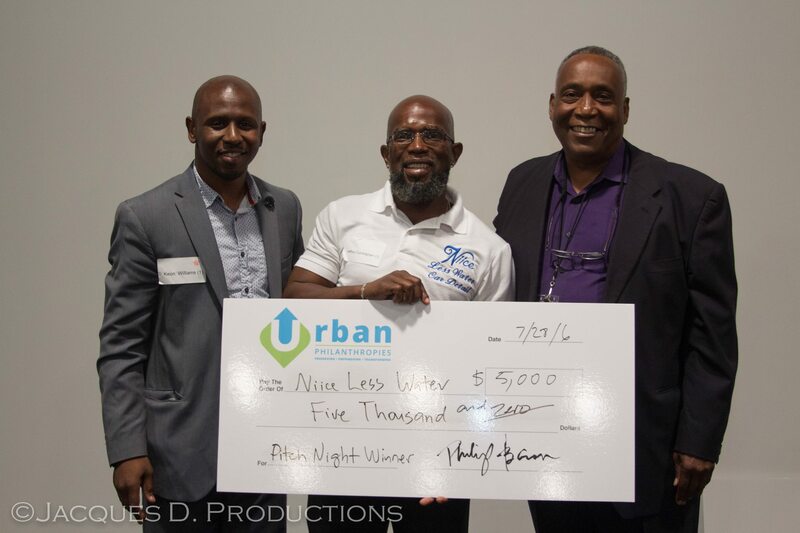 Jeffrey Cunningham, owner of Niice Less Water Car Detail, winner of Urban Philanthropies Pitch Night Competition. Urban Philanthropies has teamed up with the Partners for Self Employment to provide Entrepreneurial and Financial Literacy Training, combined with peer-evaluated business loans to be granted to selected future business owners to assist in a successful startup. Some of the Curriculum Courses include developing a business strategy, basic cash flow, marketing and customer research, and the development of a marketing strategy. After classroom completion, participants will present business plans and apply for micro loans to start their business in the Miami community, with guidance from Urban Philanthropies. The primary goals of this computer training program sponsored by Urban Philanthropies is to better prepare residents for higher­ paying technical jobs and to increase the diversity in those jobs by preparing residents to meet the technical needs of the industry. Core IT skills based on (DoD) Department of Defense protocols will be adopted to provide guidance and procedures for the training and certification program. This program is designed to provide targeted rental assistance to families in Overtown who have been impacted by relocation and could successfully maintain housing with appropriate financial assistance and services. Learn more about Urban Philanthropies, Inc.